In spring 2017, De Correspondent, the Dutch member-supported news site, announced that was expanding and launching an English-language version based in New York, called The Correspondent. The Dutch version of the site launched in 2013 on the heels of a crowdfunding campaign that raised $1.7 million. Correspondent co-founders Ernst-Jan Pfauth and Rob Wijnberg moved to New York in November 2017 and began a year-long process of building the foundation to launch the site in a similar fashion with a crowdfunding campaign. Their work paid off. 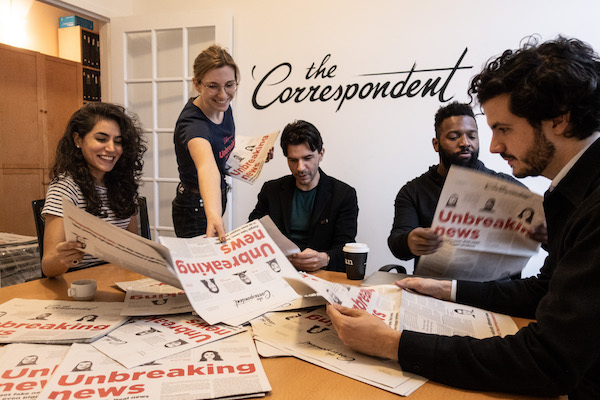 The Correspondent launched the campaign in November 2018, surpassing its goal of $2.5 million. You can read more about The Correspondent’s approach to the crowdfunding campaign in this week’s issue of Solution Set. I spoke with Pfauth to learn more about The Correspondent’s approach to the campaign. I thought our conversation was so interesting that I wanted to share a transcript of our chat in addition to the typical Solution Set report. Joseph Lichterman: I think it’s very interesting that you worked with Blue State Digital (which worked for Barack Obama’s two presidential campaigns) on the campaign. Do you have to think of this almost as a political movement? What’s the role of marketing in journalism? Ernst-Jan Pfauth: Almost six years ago, when we launched the Dutch crowdfunding campaign, we learned that it’s really important to talk about how you’re going to help your future members. A lot of crowdfunding campaigns back then within journalism were about “save our jobs” or “save journalism,” things like that. Only journalists know what you mean about that and are convinced to support a campaign because of that message. We always thought we should talk about the solutions rather than the value we’re offering. It’s one of our challenges to explain how journalism can be valuable to your life and to your society and to be able to explain that well you need to work with people who are experienced in doing that. That’s why six years ago we started working with a design studio called Momkai, from Amsterdam, and they actually became co-founders of The Correspondent. Our CTO and our creative director are also the owners of the design studio. So from Day 1 we had that expertise in-house. They helped us come up with the name, they helped us come up with the tag line, the branding, and the logo — it’s literally the handwriting of our creative director. They came up with the ideas for the drawn avatars to make the platform really personal. From Day 1 we’ve not just been a bunch of journalists working on this publication. We were journalists, designers, and developers working together on building it. So when we wanted to launch the campaign for our English-language expansion, we were missing one important area of expertise: We wanted to build a grass-roots campaign. We wanted to build a campaign that wasn’t fueled by paid media or Facebook ads, but we wanted to build a campaign that would basically thrive because people would tell their networks and communities about it. Building a grassroots campaign like that is basically what Blue State did for both Obama campaigns and other clients that they had. That’s why we started talking to them. We talked to several agencies, but we ended up working with Blue State and we thought they could help us with that. They had the experience on how to scale a grassroots campaign like that because we had only done it in the Netherlands, a market that we know really well and where we’re well known. It’s totally different if you want to launch an English version from the U.S.
We picked the U.S. as our focus point for the campaign because it’s the biggest English-language market and we needed a partner that would help us understand that market better and would help us how we could build a grassroots campaign there. They helped us with adjusting our strategy to the U.S. landscape. They helped us with messaging strategy and final copy. We really worked together with them. It wasn’t like this classic client-agency relationship where we would brief them, go away, and then they’d come back with the work. We really worked together with them. We were always in long sessions together where we would write the copy together with their creative director, their copywriters and our creative team. We were working really intimately with a small number of people. Lichterman: Did you approach the American campaign differently than the original Dutch campaign? Were there any lessons you learned from your experience in the Netherlands? Pfauth: The biggest difference was that six years ago in The Netherlands we were quite well known and we already had experience. They knew our work. We had a track record. And, if we said something, we’d get an audience. We could go on a TV show in the Netherlands that 10 percent of the adult population watches and we could launch the campaign there. Obviously that would be very different in our U.S. campaign. Nobody knows us outside the industry. We also don’t have that track record. We have a proof of concept, of course, in the Netherlands, but it was hard to talk about that proof of concept. For example, people asked us why we didn’t have samples in the global campaign? We did not have that because sample stories would not do justice to the community around our journalism. That’s what makes our model interesting and valuable. We really had to think about how we’re going to talk about this in the crowdfunding campaign with the knowledge that nobody knows us, we can’t really build it around sample journalism because it wouldn’t do justice to our movement. We had to think about how to reach people and why would they trust us? Very early on we figured that’s why we need to work with ambassadors, as we call them. People who are aligned with our founding principles and who have a group of followers or a community that they could point to The Correspondent. That’s a program we developed in-house with Momkai. That really helped us with finding an audience in the early stage of the campaign. At some point we still needed media attention. Every crowdfunding campaign needs media attention, and we got that because of the ambassador program. 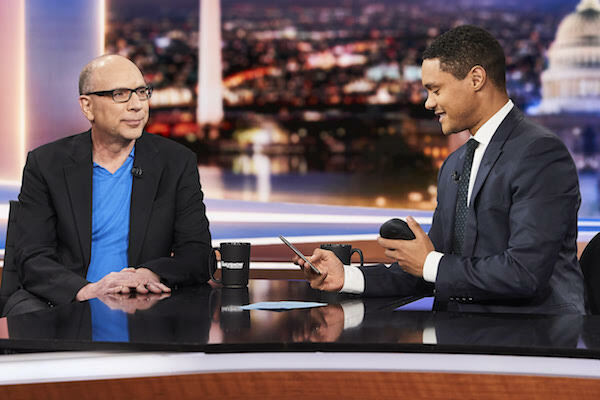 And one of our ambassadors, Jay Rosen, was on the Daily Show, for example. That was the biggest difference: No one knew us and we didn’t have a track record, so we had to adapt to that. Lichterman: How did you build out the list of ambassadors? Pfauth: We asked all our staff in the Netherlands and our members: Who would you ask to be an ambassador? We explained the concept, and then we asked who would you suggest? We got a whole list. At the same time, the network of ambassadors grew with every new ambassador who joined. One of the first questions we would ask new ambassadors was: Who would you suggest as a fellow ambassador? We basically had to look at the existing network that we had and build it from there. We hardly had any cold calling. Most of the people we met through existing ambassadors. Ambassador number 1 was Jay Rosen and there was a smaller group of ambassadors who we started with right away. For example, Jay introduced us to Rosanne Cash because Rosanne followed him on Twitter. She grilled us for 45 minutes and then said she was in. Then she introduced us to new ambassadors like David Simon, the creator of the Wire. That’s how it went with most ambassadors. We hired Baratunde Thurston to help us with the ambassador program. After six months or so we noticed that we needed help on that program so he joined our campaign as a freelance strategist and one of his main responsibilities was the ambassador program. He really helped us build up the network as well. Lichterman: You announced that you were coming to the U.S. in 2017. It seems like having that time to build a foundation and develop that network was quite important. Pfauth: Rob Wijnberg, the founding editor, and I moved to New York in November 2017. We gave ourselves a year to launch the crowdfunding campaign. In the Netherlands, we had 10 years of experience and 10 years of building up a network there. Now, we had to replicate that. Of course, we had a network in the U.S., but it was very small and now we had to replicate that whole process in a year. A year is long, but at the same time it felt very short when we were in it. We kept the launch date a secret until the actual launch of the campaign. A Dutch reporter visited us from a business magazine like two weeks from the campaign, and he said: “You moved there a year ago, when are you going to finally do something?” I remember that some people got impatient with us. They thought it was a long time. But we really need that time to build up a network and prepare for a campaign. Lichterman: Another interesting thing, I thought, was that you allowed people to name their own price. Why’d you decide to take that approach? Pfauth: We want to be as inclusive as possible. One of the challenges with the membership model is that basically if you want to participate in our journalism, if you want to contribute, if you want to have a discussion with The Correspondent you have to be a member. Anyone can read the articles, but to be a member of the community, you need to pay. We felt, over the years, that we needed to come up with a solution for that. For a very long time, we did not want to take the risk of launching pay what you wish in The Netherlands because we already had an existing model and 50 jobs depend on that. We figured that this expansion is a perfect way to test this. Eventually, a year after we launch the English expansion, we’ll decide if we want to launch this model in The Netherlands. But I hope the answer will be yes; I hope this will work. That’s because it’s more inclusive: Anyone can be a member. It’s also hard to come up with a price point that makes sense for everyone. We want this to be a global movement. Our campaign headquarters were in New York because it’s the biggest English market, but as soon as we start publishing we want this to feel like a global movement. We want people all over the world to read for us and to write for us. And you can’t come up with a price point that works for that. What feels very cheap in the U.S. could feel very expensive in another country. We trust people. If they want to be a member, they can decide what makes sense as a membership fee because nobody knows their financial situation better than they do. Based on that inclusivity, that solidarity, and that trust we decided to give people the option to pay what they want, with a minimum of $1, 1 pound, or 1 euro. Lichterman: Still, when I signed up toward the beginning of the campaign, the default price was $50. It was clear that you were trying to nudge readers toward a certain price. Pfauth: We came with those options, and we changed them during the campaign. The lowest amount was 50 euro or $50. We changed that to $25 after we went on the Daily Show. We thought that people who became a member before that either knew about us through our existing network — so they’re more likely to become a member — but if you’re outside our network you might want to give it a try and that’s why we lowered that amount. We wanted to give these options. In the Netherlands, our membership costs 70 euros a year or 7 euro per month. Here, we came up with these options that felt logical and we had a clear button that has a different color, so it stands out, that you can choose whatever you like. We tested this and it worked well, so we kept it. Lichterman: The Daily Show exposed you to a new audience, clearly. How important were those big media pushes to your success? Pfauth: Every crowdfunding campaign needs media attention, especially if you don’t have paid media. We did some experiments with paid media, but, basically, for 99 percent it was an earned media campaign. We started reaching out to the press as soon as we arrived in New York. Our first meeting with someone from the Daily Show was in May, then again in August, and then again during our campaign. It took a really long time to materialize, but when it did, it really helped the campaign take off. We expected media attention earlier. We planned to launch after the U.S. elections because we felt that the week after the elections would be a week in which people would be sensitive to our message of unbreaking news. But, it was such a crazy period of time — and it still is — that it was really hard for us to have media attention. We had less media attention in the earlier days than we expected. In the end it materialized with the Daily Show, CNN, the Young Turks, The Washington Post, and NBC covered us. Without that it’s impossible to do something like this. Lichterman: Given the craziness of the daily news cycle, which you mentioned, do you think that it will be a challenge to break through that since your coverage is going to be a bit different? Pfauth: No because now we have our own membership base and we can start practicing what we preach. That’s going to be a big difference. In the Netherlands, we had a crowdfunding campaign and then we launched six months later. Than we started growing really fast because the stories started doing the work. The stories started doing the work. We were basically promoting The Correspondent. Letting your journalism speak for itself and creating a great user experience around that has always been the best way of marketing for us. I expect a similar dynamic when we launch in the English language. Lichterman: In 2015, I wrote an update about the state of De Correspondent two years after you started publishing in the Netherlands. One of the things that stuck out to me then was that there was a drop in members after their initial year-long contribution expired. Is that something you’re thinking about as you look ahead now? How are you going to try and retain members? Pfauth: We made the same decision as we did six years ago. We didn’t make it a recurring membership. It was opt in. We don’t think it makes sense to start off with a recurring membership. We have to prove ourselves. We’re basically telling people: Give us a year and a financial contribution and we will prove ourselves to you. Even though that’s going to give us some sleepless nights at some point, as it did in the Netherlands. I’m hoping that doesn’t here because we’ll be more focused on getting people to a recurring membership as soon as possible by making great work and by notifying people that there’s an option to have a recurring membership. We learned a lot from that experience five/six years ago. We still have the same principle, but we’ll do better in the execution for getting people to recurring membership. Lichterman: What did you learn? How are you going to try and execute it? Pfauth: We learned in the Netherlands how transparent you can be with your members. 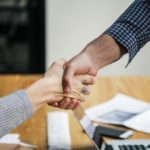 If you have a completely member-driven organization, you can basically discuss 90 percent of the challenges or dilemmas you have with your members because we’re all in this together. For example, in The Netherlands, we began publishing financial reports about how we spend membership fees. That’s what we’ll be doing with our English version as well. Those are the moments when we can talk about the importance of a recurring membership, for example. Lichterman: Even with recurring membership, do you think membership alone is enough to sustain the organization? I know in the Netherlands you also publish books, for example. Are you thinking about diversifying revenue? Pfauth: I think it’s enough. I think we can sustain this with membership because there’s so much growth potential, and I think the best use of our time and resources is to really focus on creating the best membership experience both journalistically and with user experience. That’s how we can grow this journalism organization. In the Netherlands last year, 15 percent of our revenue came from book publishing. We stopped doing all the other activities. In the Netherlands, it’s going to be X percent member revenue and X percent book publishing. The other revenue sources distracted us to much from the membership model. With the books though it makes sense because it’s building upon what happened on the platform, using the medium of the book to explain what our research is about, draw some conclusions, and reach new audiences. And, of course, each book is an opportunity for us to promote The Correspondent. I expect that at some point we’ll start publishing books with our English-language version as well. But most of our efforts will be focused on membership. Lichterman: Now that the crowdfunding campaign is done, what are you focusing on? Pfauth: We want to start publishing in mid-2019. We don’t have a specific date yet. We want to start hiring in February, and by start hiring, we mean talking about the topics we want to cover. And we’ll, of course, discuss this with our members and ask them what they want to know more about or what they already know a lot about that they could help us with. We went to get a better grasp of what our membership base wants to see covered. Of course, our editorial staff also has a lot of ideas. Based on those discussions our editor in chief will come up with the first correspondents and topics. It’s not like we will say here are five topics we want to cover, let’s find the correspondents who can cover those topics. It will be a mix. Sometimes we’ll meet someone and they can completely convince us of why we need to cover a certain topic and why it matters. We could then decide to hire that person even though that topic wasn’t our initial focus. At least that’s what happened in the Netherlands. We’re taking enough time to build a great staff, to adjust our CMS and platform to another language, and we’re basically using the whole month of January to make the strategy for the launch based on all the new info we gathered during our campaign. Lichterman: It’s so interesting that you haven’t started publishing yet and don’t know what you’re going to cover yet, but you’re able to pitch people on joining the site. How do you think about that without the sampling you mentioned? Pfauth: We’re a mission driven journalism movement. That’s why we talked about our mission, about the mechanics that make sure we can live up to that mission. That’s what thee campaign was about. Of course, we explained to people that we want to go beyond the news of the day, that we want to not focus on the sensational, but on the fundamentals. That idea, and also the whole dynamic of the movement is what, I think, appealed to people. And, also, that we gave them the opportunity to share what they want to see covered. Lichterman: One last thing I wanted to ask about, was the platform, which you mentioned. The Correspondent built its own CMS. Why’d you decide to go that way? Pfauth: Our creative director has this philosophy of cultivating calm. He believes that only the journalism should drive you to distraction. All the other things should be calm. By building our own CMS we can completely control the experience that our authors have within the most important tool that they work with and also that our users have. If you look at a CMS that’s already out there, you don’t have to make conscious decisions about what you’re going to use. But if you really have to build something it follows a deliberate strategic decision. For example, if I use a CMS that has a comment section and it has a like button for every comment, you can just switch it on because it’s simply there. But we wanted to look at every feature and ask do you really need this or really want it? Designing and building our CMS ourselves gave us a lot of focus that helped both our writers and our readers and make sure that all of the journalism — because we believe the CMS is journalism — revolves around the mission that we have.